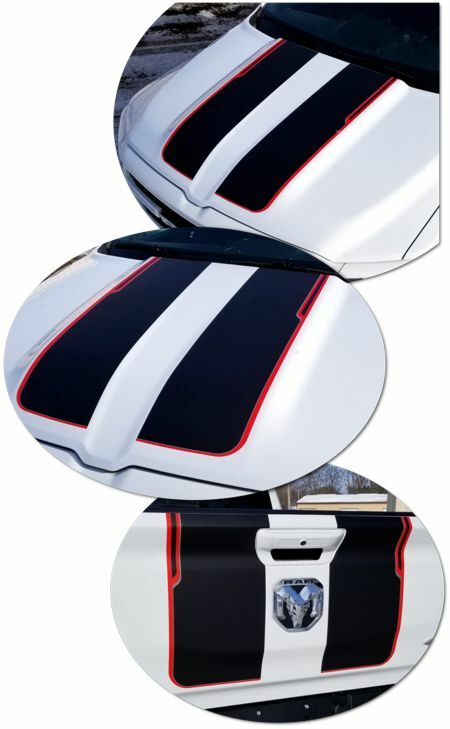 Rock your RAM with this great-looking four (4) piece Hood and Tailgate Accent kit! Available in one (1) of two (2) color combinations, graphics are digitally printed with DuraCOLOR graphic technology and manufactured with premium automotive grade metallic vinyl film materials. Vinyl product is manufactured with a grey-pigmented solvent-based repositionable adhesive and cast construction for highly conformable performance of the most difficult curves and irregular surfaces. As a further step, graphic is covered with a 2 mil clear laminate (Gloss or Matte) which provides protection from miles of abuse. Kit is designed to fit '19-Current RAM Truck models with factory Hood shown.